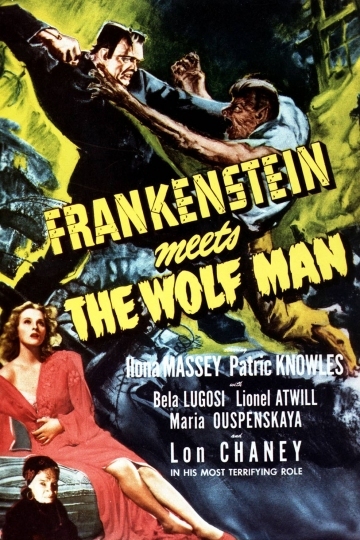 Hollywood's best-known monsters collide in one of the great classic horror films of the 1940's. This terror-packed story features Bela Lugosi as the Frankenstein monster and Lon Chaney, Jr. as the cursed Wolf Man. Beginning as a moody chiller, director Roy William Neill sets the stage for an unforgettable clash. The resurrected Wolf Man, seeking a cure for his malady, enlists the aid of mad scientist Patric Knowles, who claims he will not only rid the Wolf Man of his nocturnal metamorphosis but will also revive the frozen body of Frankenstein's inhuman creation. Co-starring Maria Ouspenskaya, Lionel Atwill and Ilona Massey, this is a chiller for fans of all ages. Frankenstein Meets the Wolf Man is currently available to watch and stream, download, buy on demand at Amazon Prime, Starz, Vudu, Google Play, iTunes, YouTube VOD online.